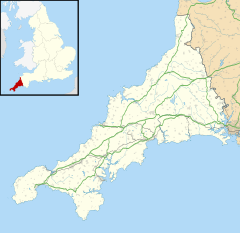 Lanreath (Cornish: Lannreydhow) is a civil parish and a village in southeast Cornwall, England, United Kingdom. The village is situated five miles (8 km) west-northwest of Looe. The name Lanreath (pronounced Lanreth) means 'church (Lann) of Raydhogh' and it has been known variously as Lanreythow, Lanrathew, or Lanrethou. The village is mentioned in the Domesday Book as Lanredoch. Lanreath parish is entirely rural in character; apart from scattered farmsteads, the only two settlements are the hamlet of Bocaddon and Lanreath village. The parish is bordered to the west by Boconnoc and St Veep parishes, to the south by Pelynt parish, to the east by Duloe parish, and to the north by St Pinnock parish. At the time of the Domesday Book (1086) Lanreath was one of 28 manors held by Richard from Robert, Count of Mortain. There was one hide of land and land for 8 ploughs. There were 3 ploughs, 4 serfs, 4 villeins and 10 smallholders. There were 30 acres of pasture, 40 acres of woodland, 3 cattle and 60 sheep. The value of the manor was 25 shillings. The church is dedicated to St Marnarck (although it was originally dedicated to St Sancredus). Part of the walls are probably Norman but the church is otherwise of the 15th century; according to Pevsner "wholly Perp. and especially complete and satisfying". It was well restored in 1887 by G. F. Bodley. The font is Norman, of the Fowey type, ornate and of Catacleuze stone. The rood crosses both nave and aisle and is substantially original, though restored in 1905. There is more interesting woodwork dating from the 16th and 17th centuries. The monument to Charles Grylls and wife, of 1623, is ornate and unusual, being carved in wood. Near the church is the manor house of the Grylls family, ca. 1610, but much restored in 1899. The former Lanreath primary school closed in 2007 with a roll of only 11 pupils. A BBC documentary, Power to the People, was broadcast about the plight of rural villages and the closure of Lanreath CE Primary School. Lanreath has a small museum, the Lanreath Farm and Folk Museum, which has preserved artefacts illustrating the everyday life of the people of the district in earlier times. From small beginnings in the 1960s the Facey family have enlarged the museum to the present varied range of exhibits. ^ "Old Cornwall remembered: Farm and Folk Museum, Lanreath". Cornwall - Attractions. BBC. 2004. Retrieved 22 April 2010.